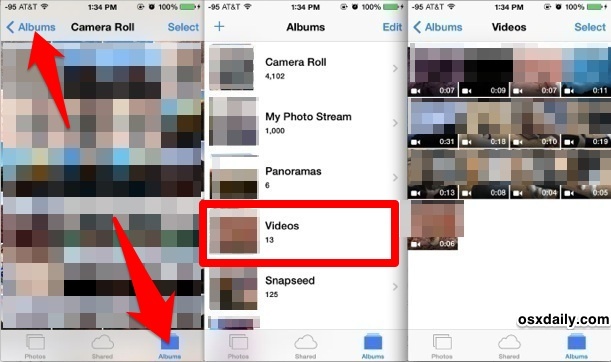 A very welcome change has arrived to the Photos app post iOS 7 that allows you to easily view only videos taken with an iOS device, presenting them in an easy to view and share format. This is a huge improvement to past editions of Photos app, and the new sorting feature prevents you from having to scroll endlessly through a gigantic Camera Roll to see what’s a movie amongst a million pictures. Before proceeding let’s quickly address a source of significant confusion for many: despite the name, the dedicated “Videos” app for iOS does not show videos taken with the iPhone Camera, it only shows videos that have been transferred or downloaded to the device from iTunes. That combined with having to go to the “Photos” app to see your personal movies remain confusing to many, but once you get the hang of this new super-simple video sorting trick you probably won’t make that mistake again, and you’ll appreciate that the downloaded videos and your own personal movies are stored in separate locations on the device. There you have it, only the videos taken from the iPhone camera that are stored on the device will be displayed here regardless of when they were taken, alongside any movies that have been saved locally to the device from emails or imessages – no more sorting through pictures to look for that tiny little video camera icon to determine whats a movie and whats a picture. Videos are shown in chronological order from the oldest to the newest, making it fairly easy to know where to look for specific events, and making it simple to quickly send out videos, share them on social networks, or create a public website of them if desired. Tap back to the Albums screen and choose Camera Roll to view your entire combined photos and videos collection as usual, just as it appeared in prior versions of iOS. The new Collections and Moments views, accessible from the Photos app by choosing “Photos” and then selecting a year, also follows the classic all-in-one listing of movies and pictures, but they are sorted by dates which can also make it easier to find a specific video you’re looking for. And yes, as usual this also applies to the iPad and iPod touch running iOS 7.0 or newer, but we’re emphasizing the iPhone here because out of the three iOS devices it is the one perhaps most commonly used as a full-fledged camera for taking photos and videos.